When you manage people, sooner or later you find yourself in a situation where you need to have a conversation you’d rather not have. In fact, more than one-third of managers admit to shrinking away from giving bad feedback when they anticipate a negative reaction. We’ve all been there. A project blows up and people are pointing fingers. There’s a conflict between two employees that’s getting destructively personal. One of your employees dropped the ball so badly even your boss noticed. It’s definitely not the most enjoyable aspect of leadership, but difficult conversations are part of the job. So we can’t avoid them. All seasoned managers know, despite a potentially awkward confrontation, the consequences of letting an employee underperform or flout the rules can spiral into something worse. With a little twist in our approach, however, we can make those dreaded talks a lot less painful. How we present ourselves during difficult conversations can make them not only go more smoothly but also make them more effective. What works is to take the emotion out of the conversation. Hard talks are loaded with at least a little drama, so being as objective as possible makes them go more smoothly. For example, an employee tells you a manager in another department is purposely sabotaging a project she’s leading. Since you’re friendly with the other manager, you want to give him a heads-up before things start to spiral out of control. Ideally, do this in a supportive environment – say on a lunch break or during a mid-afternoon walk – so the conversation can begin a bit more relaxed. This approach signals that you’re not taking a side, not jumping to conclusions. Be sure to relay only what you were told without inserting personal comments or gossip. There may be denial and some pushback. But the fact is you’re a peer and not a boss. You hold no power or authority over this person. You’re talking as a concerned colleague to give him a chance to see the situation as it develops, and perhaps make the best adjustments. Sometimes you must have a difficult conversation with a superior, and those may be even more stressful if you think the person won’t react well to what you have to say. It’s normal to think that if they don’t react well to the conversation, it may hurt your career. In such cases, always remember you work for the organization, not your bosses, and your first duty is to the company. Also, keep in mind that if you were the boss, and there was a potentially bad situation you weren’t aware of, you’d likely want an employee to bring it to your attention. It’s a good idea to open with just that thought when you have the conversation. Then come right out with it. Limit yourself to facts or concrete observations, nor rumor or conjecture. By treating your boss in the way you’d want to be treated, you show loyalty and trustworthiness. The more open and honest you are, the less likely your boss will want to choke the messenger – he or she may even thank you. 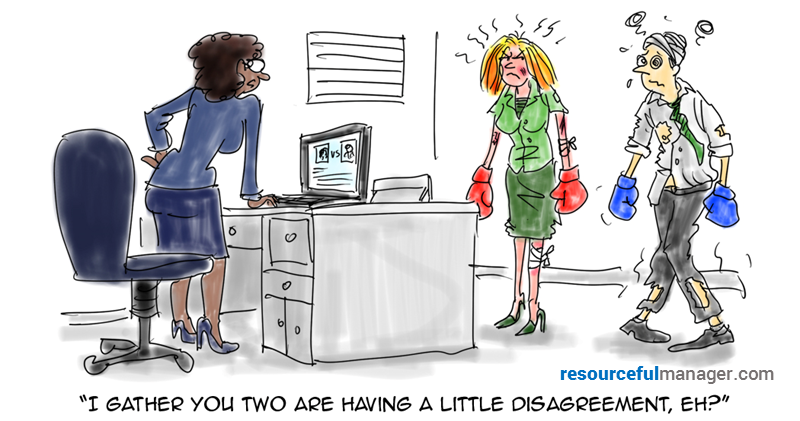 Some difficult conversations involve playing peacemaker between your direct reports and other co-workers. Emotions are probably running high by the time you hear about the problem, so you know going in the discussion could get testy. In those situations, you’re better off meeting with both sides separately before getting them in the same room to hammer out an agreement. Listen to everyone involved and try to see their point of view, even if you disagree with it. Find points that both sides can agree on, then assemble everyone together. Rather than ending unpleasantly, the conversation could inspire both parties to adopt your consensus-building attitude. Remember, the reason why some conversations are so difficult is that you’re dealing with others’ conflicting opinions, ideas and emotions. It pays to tailor your approach from one of judgment to one of support. 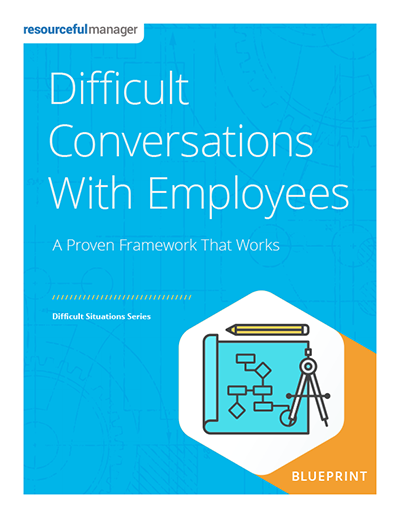 If you are frustrated by difficult people and stressed at the thought of having an awkward, but necessary, “high stakes” conversation, then check out our Difficult Conversations With Employees Blueprint.